Somehow February more than any other month reflects just how distinctive California’s gardening blessings are. We have so much to admire and to plant. Consider the five below California classics — favorite plants that excel this month, defying winter with vivid color, alluring fragrance and, in some cases, mouthwatering flavor. Meyer lemon. Seemingly forever this was the ultimate California backyard fruit. It was in every garden, a handsome evergreen shrub with fragrant flowers and abundant fruit. Was it ever abundant! Our one shrub produced so many lemons that we couldn’t give them away, and our golden retrievers munched on the fallen lemons (nice breath!). Then a couple of things propelled Meyer lemon to a new level of desirability. In the 1970s plant breeders developed ‘Improved Meyer’, resistant to the virus that had led to a ban on interstate shipping of Meyers. And Alice Waters got hold of the lemons and made the most of their juiciness and lower acidity. I still remember the first time I tasted a wine spritzer made with Meyer lemon that the restaurant Chez Panisse served in the 1980s. In 1987 The New York Times published a recipe for Chez Panisse’s Meyer Lemon Meringue Pie. It’s easy to find a spot for Meyer lemon in almost any garden. Plant one near a patio, in a border or trained as an espalier on a wall or fence. It will produce fruit all year, including in winter and early spring, when it is most welcome. Water requirement: Moderate and regular. Don’t let the soil dry out. Light requirement: Full sun; a little shade is OK in warm climates. Mature size: 8 to 10 feet tall and 12 feet wide. Dwarf types are available. Growing tips: Prune in spring to control the size and shape. 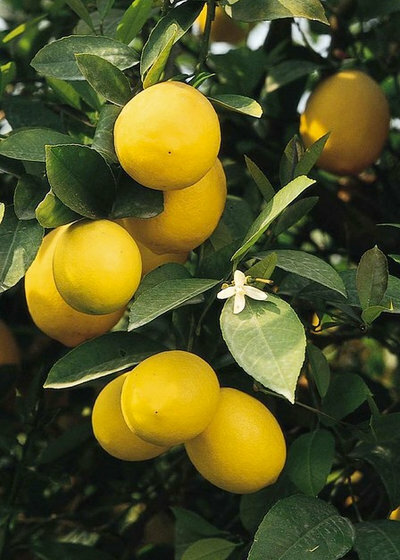 Fertilize regularly with a special citrus food. Yellowing leaves often indicate deficiency in nitrogen or iron; correct that with products specifically for those conditions. Saucer magnolias. 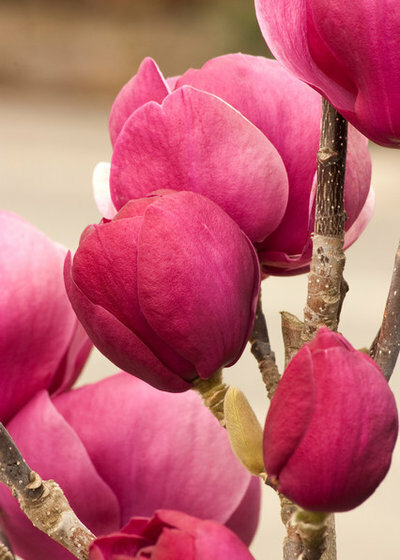 Also called tulip trees, these are varieties of Magnolia soulangeana, a deciduous small tree with supersize flowers on bare branches in late winter and early spring. Colors range from pure white to purple — some are so shockingly dark that they look black. Shown here is ‘Black Tulip’. Considering their good looks, saucer magnolias are surprisingly easy to grow in almost all California gardens. They make great lawn trees. Smaller varieties can fit into a border or raised bed of spring-flowering annuals and perennials. Wherever you put the tree, make sure it’s a focal point at this time of year. Mature size: 15 to 25 feet tall and 6 to 15 feet wide, depending on variety. Growing tips: Provide rich soil, with plenty of amendments at planting time. Don’t let the soil dry out; watch for sogginess. Prune only to control size, after the spring bloom. Artichoke. This Mediterranean delicacy is best for eating in late winter and early spring along the foggy California coast. Now is also a good time to start your own. 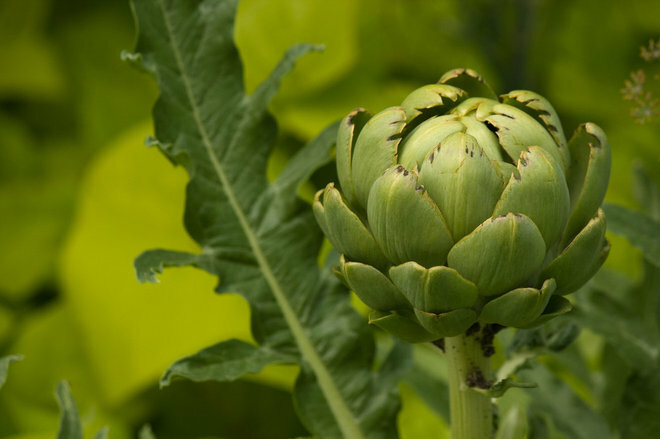 Away from the coast, expect your chokes to make tough and dry eating, but the plant is, shall we say, an interesting addition to a vegetable garden or even a flower border. It grows into a striking, if sprawly, gray-green plant in one growing season. 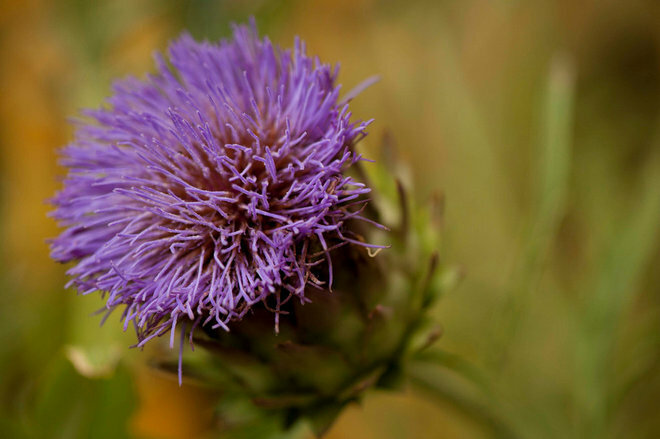 Even if your artichoke plant doesn’t do much for the dinner plate, it can produce striking purple thistles to use as cut flowers. Growing tips: Start with roots, available in late winter, or young plants in nursery containers, available all year. Keep the soil moist, particularly if you want an edible crop. Fertilize monthly. Harvest chokes for eating when they are tight, fat and glossy. If you leave the chokes on, they will develop into eye-catching purple thistles; cut them just before they fully open and use them as cut and dried flowers. At the end of the season, cut off the whole plant near ground level; it should resprout next year except in cold climates. Daphne odora. A total diva. Has the most evocative fragrance of any plant (yes, that’s subjective). Doesn’t deign to have a common name. Will sulk and die for no apparent reason. But try daphne at least once. Find a spot in partial shade and well-drained soil, where you can see and smell the small pink winter flowers, and give it a try. If it dies, try again somewhere else. Try it in a pot. 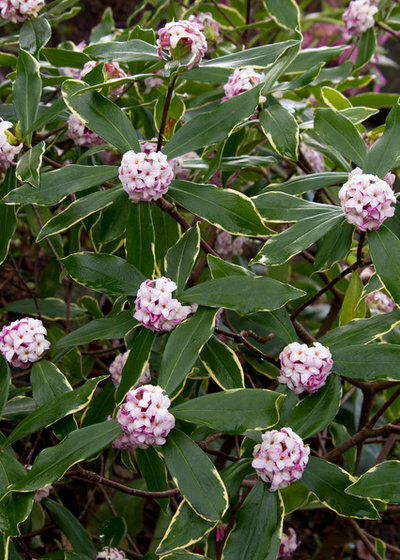 Daphne is a good-looking evergreen with dense foliage, shiny green leaves (there is a variety with variegated leaves). It looks good in a mixed border, in a raised bed and in a container. Water requirement: Moderate. Don’t let the soil dry out. Growing tips: Needs perfect drainage. Amend the soil thoroughly with compost; don’t bury the top of the root ball. To control the size and shape, you can prune, even shear back, a few inches after bloom. Camellia. Here we’re talking about Camellia japonica, the surprisingly sturdy evergreen shrub with stupendous flowers that we take for granted. It can grow in most California gardens, from the coast to the foothills, in places as warm as Sacramento or Arcadia, as cool as San Diego or even San Francisco. Shown here is ‘Guilio Nuccio’, which, according to the Sunset Western Garden Book, is “considered by many to be the world’s finest camellia.” Developed by Nuccio’s Nurseries, of Altadena, it is a vigorous, upright shrub that produces great big rose-colored flowers. Growing tips: Plant it in well-drained soil, kept moist. Mix in organic matter at planting time. 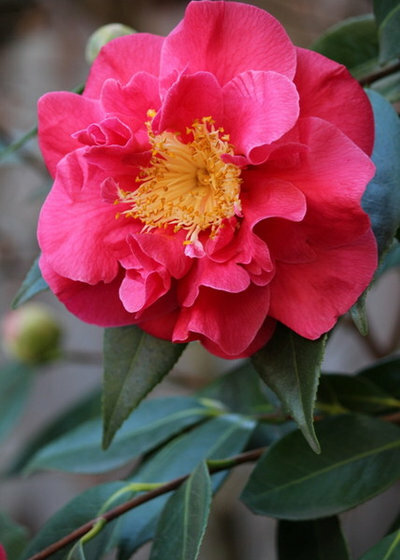 Fertilize with special camellia food after bloom. Prune after bloom as needed to control the size and encourage bushiness. Always pick up fallen blossoms to prevent spread of the disease called petal blight. Choosing a camellia. Hundreds of varieties have been developed since the introduction of Camellia japonica to California in the 19th century. Flowers range in color (white to pink to red plus variegated) and form (single to double or more complex). When choosing a specific type, keep a few things in mind in addition to the flowers. When do you want blooms? Varieties are categorized by bloom time: early (October to December), midseason (January and February) and late (March and April). Also, study variety descriptions to see how the plant fits into your landscape. Plants are described in terms such as “upright,” “tall,” “spreading,” “compact” and such. 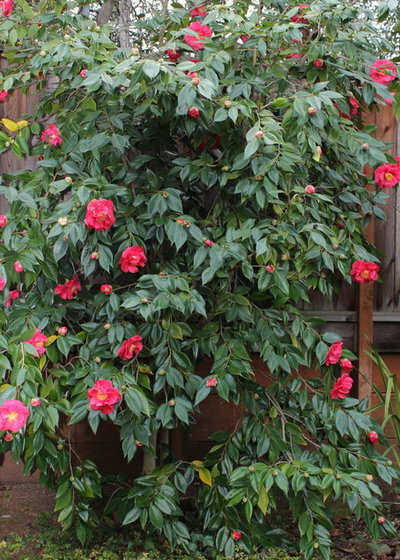 You can use a camellia as a single specimen shrub, as a container plant, for a hedge or screen, even as a small forest. The ‘Guilio Nuccio’ shown here serves as a background shrub in a raised border; about 15 years old, it is 12 feet tall and 7 feet wide, with at least 50 blooms open in late January. 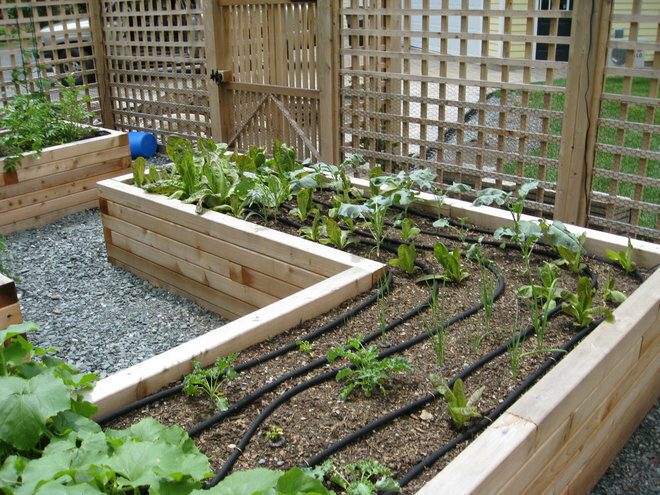 Depending on how quickly your climate warms up, there’s a lot you can do this month — including winter pruning and planting of spring flowers and vegetables, which can be sped up by the warming effect of a raised bed, as shown. Deal with frost damage. If winter frosts hit some of your plants, wait until later this month to prune off the damage. Get traditional winter plantings in the ground. Now’s time to plant bare-root roses, fruit trees, berries, even shade trees. Keep the roots moist until you’re ready to plant. Don’t buy bargain plants with dried-out roots. Plant cool-season annual flowers. They should peak in midspring and last until hot weather: calendulas, dianthus, Iceland poppies, pansies, snapdragons, violas and more. Provide the sunniest spot you can find in your garden. Set out cool-season vegetables. These include broccoli, lettuce, spinach and more. Swiss chard is really easy. Prune roses. Finish pruning this month except in cold-climates such as the high mountains. As a rule, cut back hybrid tea roses by about a third, and leave three to five canes sprouting from the base. Shrub roses need less precise pruning — basically, shear them to control the size and shape. Fertilize all roses after pruning. Prune fruit trees. Prune and spray deciduous fruit trees, such as apple, peach, apricot and pear. Check on the how-to with expert books or advisers at your local nursery. Plant summer-blooming bulbs. In a month filled with daffodils, think about planting bulbs to bloom in late spring and summer: tuberous begonias, gladiolus, tigridias and more. Snails and slugs. February could be declared California Snail Month. They like it wet and warmish (but not hot). Watch for telltale signs of chewed leaves or the creatures themselves, and scatter pet-safe bait.